Friday July 15th 1881. I was here at home all day busy with sewing when not at the house-work. The boys were down to dinner. The river is beginning to fall a little today. Weather very warm. 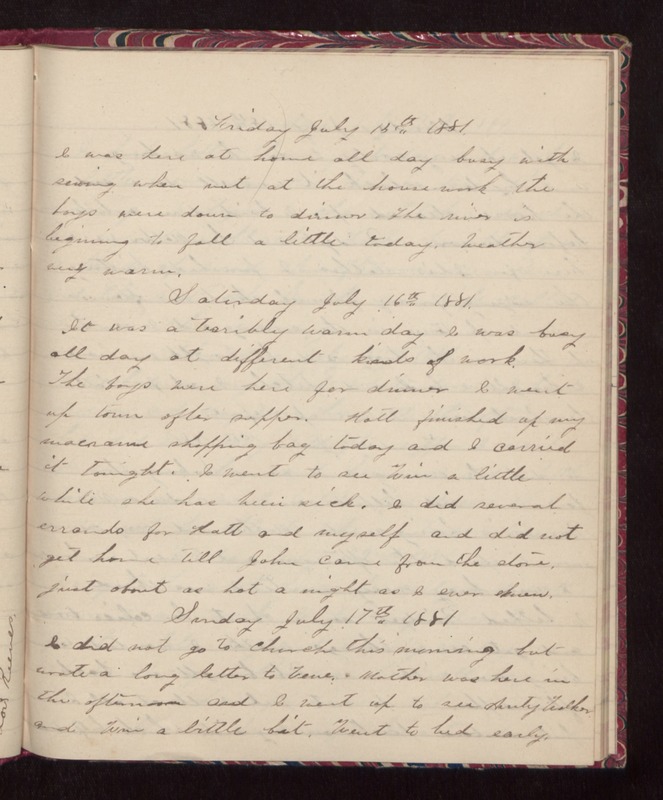 Saturday July 16th 1881. It was a terribly warm day I was busy all day at different kinds of work. The boys were here for dinner. I went up town after supper. Hatt finished up my macrame shopping bag today and I carried it tonight. I went to see Win a little while. she has been sick. I did several errands for Hatt and myself and did not get home till John came from the store. Jist about as hot a night as I ever knew. Sunday July 17th 1881 I did not go to church this morning but wrote a long letter to Vene. Mother was here in the afternoon and I went up to see Aunty Walker and Win a little bit. Went to bed early.